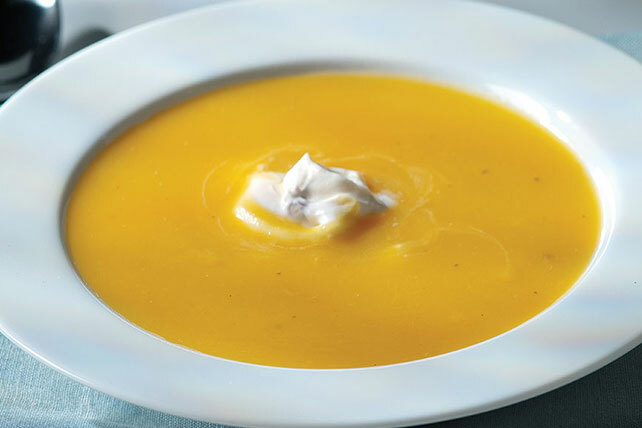 Enjoy a warm and delicious dish with our Spiced Apple-Butternut Squash Soup Recipe. You may never go back to a regular butternut squash soup, Spiced Apple-Butternut Squash Soup. Melt butter in large saucepan on medium heat. Add onions; cook 4 min. or until crisp-tender, stirring occasionally. Stir in nutmeg; cook 1 min. Add squash, apples and broth; stir. Bring to boil; cover. Simmer on medium-low heat 50 min. or until squash and apples are tender, stirring occasionally. Cool soup slightly. Add, in batches, to food processor or blender; cover. Process until smooth; return to saucepan. Cook on medium-low heat until heated through, stirring occasionally. Ladle soup into 8 serving bowls. Add 1 Tbsp. cream cheese spread to each bowl; stir gently to swirl. Substitute chopped peeled pumpkin for the butternut squash. Prepare as directed, but do not reheat the pureed squash mixture or top with the cream cheese spread as directed. Cool completely. Cover and refrigerate up to 3 days. When ready to serve, pour into saucepan and cook on medium-low heat until heated through, stirring frequently. Top with the cream cheese spread as directed.